Nike Sparq 6 | Flickr - Photo Sharing! Photos taken at the Tigard, OR High School Football Combine. Role: Motion Design, Animation, Application Design and Development, Real Time Data Integration. 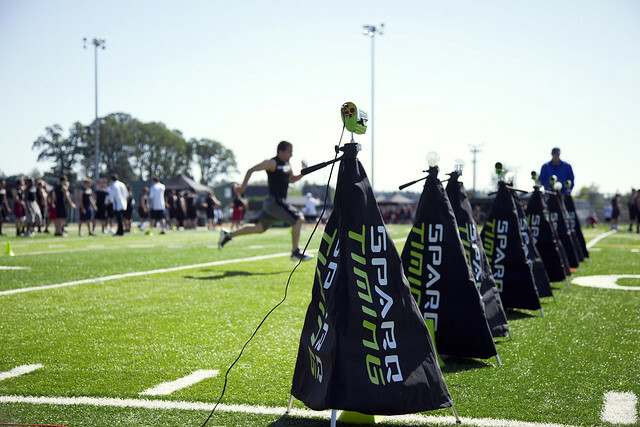 NIKE SPARQ helps athletes train, rank and chart their progress. SPARQ is revolutionizing the way athletes are objectively ranked nationwide for college recruitment. NIKE SPARQ events are designed to help athletes train better, but also to let them know where they stand. NIKE SPARQ approached theGOOD to create installations that run on multiple large screen displays at SPARQ events. Each display shows an athlete's statistics as an event progresses, giving real time feedback on an athlete's performance. theGOOD also integrated an admin application that allows on-site SPARQ trainers to control multiple data feeds, interfaces and presentations independently on any of the large screen displays. We’re excited about our new relationship with NIKE SPARQ and look forward to working with them more, both in and outside of the web browser. Uploaded with theGOOD Uploadr. Almost certainly the best flickr uploadr ever.